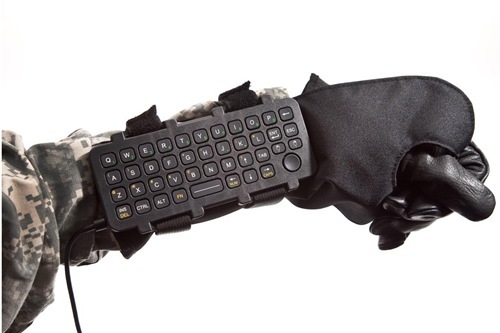 iKey Crafts A Rugged Wrist-Mounted Keyboard For Soldiers | OhGizmo! How many times have you been in a war zone and needed to quickly and quietly get a message to someone? Sure, I’m guessing that a lot of you haven’t been in that situation, but I’m sure that it can be rather a difficult task. Well this new AK-39 keyboard was designed to help overcome that obstacle. Besides the obvious ability to be strapped to an arm, the keyboard can withstand harsh electromagnetic interference and has LED backlighting so it can be used with night vision goggles. Now I just wonder how long it’ll be before someone makes a cheap knockoff for cell phones. There’s no word on pricing, but iKey is happy to send you a quote if you’re really interested. Soldier4U: What ups my twitter-peeps .. I just carpet-bombed a whole mountainside LOL.